Clear Aligners in Tweed Heads near the Gold Coast. A smile is often the first thing people notice about you. A simple smile can warm people to you, it’s the most natural instinct, so why fight it? When you have crooked teeth, it can often prevent you from wanting to smile. Don’t hold back, call the Orthodontist at Invisible Lingual Braces in Tweed Heads near the Gold Coast and see how our clear aligners can discreetly give you the smile you’ve dreamed of. With more people than ever before opting to straighten their teeth with the aid of braces, why not? Clear Aligners are an alternative to traditional braces and are designed to help guide teeth into their proper position. Similar to braces, Clear Aligners use a gradual force to control tooth movement but without metal wires or brackets. Clear Aligners are custom-made to fit the individual person’s mouth. Clear Aligners should be worn for up to 20 hours a day to get the desired results. After approximately a two to three-week period, a new Clear Aligner will be fitted as your teeth move in increments. Whilst Clear Aligners are a discreet way to straighten your teeth they may not be suitable for all cases, so speak with our Orthodontist at Invisible Lingual Braces in Tweed Heads near the Gold Coast to find the best treatment plan for you. Now we know what Clear Aligners are, what are the benefits? Clear Aligners are removable and as such are a far more hygienic option. You can take them out to eat. When brushing and flossing you can easily reach every surface of your tooth, which is usually a little harder with conventional braces. Clear Aligners are custom-made and usually a more comfortable alternative to traditional braces. 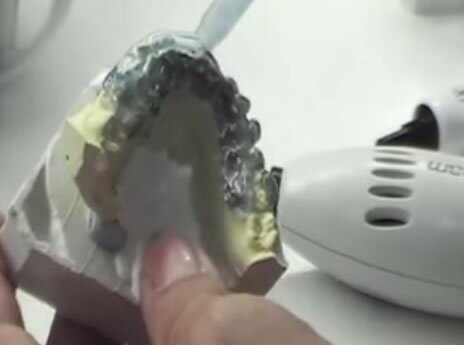 Clear Aligners are easily taken out and cleaned. If you want to achieve that perfect smile but you are worried that your treatment might not be finished by the time a special occasion falls, Clear Aligners might be the perfect option. Not only will you get to see the results, whilst we don’t advice you take them out very often, the option is there for a special occasion. Getting married and want the perfect smile? Whilst an Orthodontist can estimate how long a treatment plan will take, it’s not always set in stone. With Clear Aligners, there’s no need to wait. You can see the results and if needed take the Clear Aligner out for those wedding snaps and that all important first kiss. Invisible Lingual Braces in Tweed Heads near the Gold Coast understands that whilst you might want the smile of your dreams sometimes the upfront cost can be a little daunting. We want everyone to be happy with their smile, and our interest-free payment plan through our partners at Denticare is our way of making the dream a little more achievable. At Invisible Lingual Braces in Tweed Heads on the Gold Coast, our Orthodontist can advise you on the best treatment for your individual needs. With so many braces on the market, we can consult on all the options available to you and provide you with all the relevant information so you can make an informed decision.